Last year, my New Year's resolution was simple: Don't remove any of the stickers on the back of my Chapters gift card. Let me back up. Chapters is one of the local coffee shops I frequent, and they have gift cards. Rather than always carrying cash, or risk putting only a couple bucks on a credit card and incurring a 50 cent charge, I acquired a gift card that I refill once a month with my allotted coffee budget. This makes it easier to budget my coffee habit and avoid the aforementioned pitfalls. 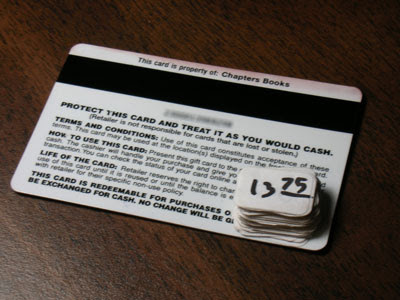 In order to keep a running tab of how much is on the gift card, Chapters will put a little sticker on the back with the current amount. For the most part the stickers are torn off when a new one is ready to be applied, or at least when the total is down to zero. This is not for me. For 2008, I decided I would not let those stickers be torn off. Now that 2009 is here, I can see the fruits of my labor: a thick stack of stickers on the back of my Chapters card that somehow miraculously managed to fit into one of the card slots in my wallet time and again. This stack represents a year's worth of Chapters coffee purchases. The question this year is not "Should I do it again?" (The answer is, "Of course!") Instead the question is, should I (or can I afford to) try to make the stack larger this year than it was in 2008? 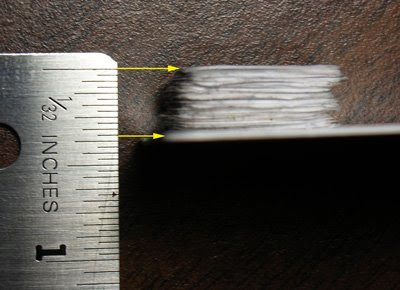 See the record stack below... and tremble! HA! That's classic ;). Good luck in 09 :). I thought you'd meant they were everywhere all over the back of the card. This is much sillier. And awesome.